We're not going to forget it, the opening screen: poultry, jack or tin and paper case, ditto section. You have to move in close to read all this, using negatives, saying what is not—torn in a seacup, eye full of clipse. First the green line. One thing I am certain about: the language filched from passers by. Immaculate simplicity of narrative. It's a method known to stop anything in its tracks. She is born with her head wrapped around a name, a big chunk of it. For the last few years Richard Makin (the "A" seems to be optional) has been publishing in monthly instalments on the Great Works site run by Peter Philpott. Work in Process began publication in 2004. It was supposed to run for a year, but in the event it carried on for more than two, so the complete text runs to 30 parts, separated by photographic images. St Leonards followed immediately and is, as I write, on its seventh instalment: not too late to get with it and to enjoy - if that is the right word - the curiously compulsive exercise of waiting for the next episode and its surprising turns (which are always a surprise) and its revelations (which never materialize). Right now, this is one of my favourite books. The two works are not entirely discrete, so that for example "a rust chute emptying into the sea" in SL2 repeats an image that first showed up as far back as WiP2; "the great arterial trunk that carries blood from the pump" varies a definition of aorta first seen in WiP29; longstanding motifs such as the descent and the hexagon continue to outcrop; the "young man with an ashplant" of WiP30 returns fragmentarily in SL3, part of a narrow thread of references to the Telemachia of Ulysses that still makes a remote rumble in SL7 when "She loses her implant". Serial publication posits an active relationship with a public; it recalls, perhaps, the popular frenzy whipped up by Dickens' early novels, the anguished letters and the tearful crowds waiting for news of Little Nell. Or the ill-fated serialization of Ulysses in Pound's Little Review, which finally foundered on the Nausicaa episode. Makin's serialization bears only an ironic or parodic relation to those analogues ("What she misses is that he has silenced the crowd"): what invisible audience there may be is subjected to a continuous mockery of its expectations and motives: "I am so grateful to listen in on all sorts of people thinking aloud" (SL2). Still, there are certain analogies that bear investigation. Reading a serial work as it comes out, we know that the book is still being written; we are involved in a narrative about the author's progress - something that Makin self-referentially feeds into the text. We receive the text in a series of timed releases, each advancing and not advancing our conception of the book that does not yet exist, resembling and not resembling the parts that came before. When the book is published complete, if it ever seems complete, this particular aspect of its generation of radical indecipherability will disappear, only to be replaced, however, by the ironic suggestion of indecipherability proposed by book-spines along a shelf. We also know that the book title has been made up in advance of composition; we tend to assume that it provides an insecure and provisional marker (like the material on which this note bases itself) to how the book will actually pan out. St Leonards refers casually to where the author now lives, but the book is not about the place in a simple way (it is not a simple place, except in Thomas Campbell's poem). Very occasionally, almost with a joke-like effect, a local reference crackles into view: "castle nowhere near camber, swift running flame" (SL6). And finally, Makin's serial works, like The Old Curiosity Shop, are illustrated. Illustrations for St Leonards have yet to emerge; this one is from early in Work in Process and has the caption "RX12+?". What relation the images bear to the text is a question. Perhaps a few of the recurring motifs, the pyramid and the rust chute for example, owe their origin to the images. 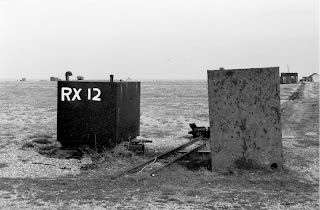 What the text tends to emphasize about the images is how much you can't understand about them; a radical indecipherability of our surroundings, not at all diminished by me supposing this to be Dungeness and knowing that RX12 specifies a boat registered in the port of Rye. Topography, both in and of the text, is stretching; reading it tugs at our patterned conception of our surroundings. Serial publication is an invitation to read; Makin's work is an experimental prose that connects, at its extremes, with both the novel and the installation - I would call it, in our present state of incompetence, partially readable. In some of his earlier work that meant reading a few words here and there. The work I'm writing about here accommodates - yes, invites, - a reading-through somewhat as a book of reflective essays or even a novel, but it does not resolve into characters, action or locale, and in fact it's impossible to hold the non-sequential material sufficiently in the mind to perform the mental exercise that we normally think of as reading. What kind of a serial is this? I have heard Makin's work described as "non-generic prose" and I like that description, which emphasizes the freedom of the reader, the potential for pioneering into land that neither author nor reader may recognize. But I know it's not so easy as all that to be truly non-generic. Makin knows it too. Programmatically self-referential, the text constantly implies descriptions of itself, as an essay ("Let's start with some basics"), lecture ("whether you might be persuaded to say a few words"), novel ("no story although a great many things happen"), automatic writing ("This is an underthread"), travelogue ("we're heading off to the opening sea"), anthology ("A selection is given"), residue ("charred leaves go up the flume"), apology ("He's reduced to justification"). Those are all in the first section of St Leonards. In the second, there's others; a trunk in the attic ("This is where I put things I reject but wish to keep"), and a crime fiction ("They believe his motive was revenge..."). That last one keeps nagging at us: coroner's reports and post mortems, archaeological pathology, provide a sinister undercurrent. Without fixed characters or locations it's going to be a tough case to crack. Where the "non-generic" tag really falls down is that it doesn't suggest the definite character of the writing, which I suppose is in this case the thing that makes anticipation (and therefore serialization) possible. the list of loss ashen graille sunk low in the minute past participles of braun sand. pin umbrella tube epic horrorscope pictures worlds for collapse in monte de pietá of wergild. an equivalence of chunnel hoping. kufa kef impulse alienated from the bable televisionary progrom twighlights of the idle of the tribe the den the cave the forum the theatre the fumes from music rising verdigris. This is fantastically inventive, but it's a bombardment. The tempo of the serial works is less frantic. Space, silence and nervous tension have crept out to the surface of the text. Animals are box office. The first impression is recovered. Box of fire. Box of ash. Words stuck to the concrete redeem the evening — ground and delivered, with screed pull to deep background square, collided. What if one of us expires on route. The ghoulest thing is the image of her face at the fourth floor window. He is conscious of, but cannot apprehend, its wayfare and flickerbook existence. Tell them the general needs you, he allows you to breathe in the sea tonight. I break away. First train back. He goes to search in his pack. Now you must away too. Carry with you this common place book. Utilize primary methods of sensation, the quality of being limited by a condition, like rising earth each side of a furrow, the ineluctable etcetera. I don't have time for this now. Perhaps the right question to ask is not about the meaning but about how the text was made. Some is arrived at by direct transmutation: "Box of fire" a typo variant of "box office", for example. Some responds to a particular groove within the chapter: in this case, a recurrent sequence of transformed cricketing terms ("pull to deep background square"). Then there are unmarked quotations and allusions: "breathe in the sea tonight" inevitably induces a spectral hint of that pained Phil Collins ballad In the Air Tonight. "The ineluctable etcetera" alludes to the start of the Proteus section of Ulysses. Other sentences look like they could be quotations but are possibly invented ("Carry with you this common place book"), like those epigraphs in the Waverley novels that are attributed to Old Play. No reader is going to know them all: the text's materials are unlimitedly various (it was by the merest accident that on second or third reading of a sentence elsewhere, "the madness in my area", I remotely recalled a Fall B-Side from 1979). Almost as tricky, if you like difficult games, is the use of dictionary defnitions that are detached from their headwords; as here, "the quality of being limited by a condition", which I am still trying to work out. Sometimes the headword may show up in due course, as happens elsewhere with distal and bearings. Often the definition is mutated, like "the part of a cartel that receives pollen" (SL7) - which would have defined stigma, when the fifth word was "carpel". She stands in a timely passage: the inenarrable modality of the invisible. There is a clerical boundary, the quality of being limited by a condition (law). In the middle of the compass a kidnap, a net: feldspar whose tissues are not at the right angles—all that bite, any mixture of them—oblique fractures, crosswise of mouth like sharks and rays, crosswise returning with transverse slit on underside of head. Vouchsafe, the walk is round the back of myself. Climb the ascent and back on to the road. Use any of the primary methods. His tendons are crushed. Classify the sensations as to whether true, false, necessary, possible or impossible (log). It's a method of progressing that makes one persistently aware of vague recognition; it suggests the illusory idea that if you could only hold the whole text in your mind at once, you'd learn something. At least, I think it's an illusory idea, but maybe it's only impractical. He touches his cheek. It's dry, but still the sting of cold spray, the taste of salt. Glister on beaded rubble, a collapse of boulders. His knuckles knock against the uneven surface of the table like dice. Erosion and sand-drift, the itinerant pebble. One flies towards him with a live coal and purifies his lips. Bringing these together (they are not adjacent in the text) reveals them as more or less closely connected; they ignite each other. The elegance too is not there for its own sake, just part of the procedure. St Leonards by Richard Makin is published serially on Great Works.